As image sensors gain higher resolution and more cameras become capable of shooting 4K video, photographers are being challenged with accelerating developments in the memory card market. 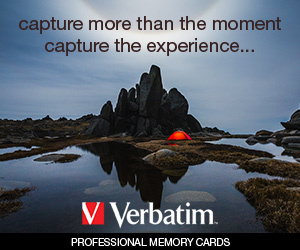 Memory cards come in a variety of shapes and sizes with different technologies and ways of handling digital data. With some cameras supporting two quite different card formats, it can be difficult to pick out the one that best suits your camera system and the images you record. With cameras that only have one card slot, the choice of card type is made by the camera manufacturer. This is true to some degree for cameras with dual card slots, particularly if both slots use the same card type. However, some confusion is likely to occur with camera systems like the Nikon D5, which comes in two versions: one with dual Compact Flash slots and the other with dual XQD slots. Each card type provides different advantages and disadvantages. Currently the most popular card type is the SD card, which is used in most video and still cameras as well as dash-cams, drones, Android smartphones and action cameras. Some laptops have SD or microSD memory card slots, but many others only offer a USB for file transfer. Compact Flash cards have been used in many professional and high-end enthusiast cameras in the past but are being challenged by CFast, CF Express and XQD cards, which offer faster read/write speed in a smaller form factor. What type of card does my device need? What application am I using the storage device for? What are my application’s capacity and file transfer speed requirements? What kind of tech knowledge do I need to use the storage device? SD cards come in three formats: SD, SDHC (High Capacity) and SDXC. A subset of the SD format is microSD cards, which can be used in regular SD slots when inserted in an adapter. Developed in 1999, the original SD cards had a maximum capacity of 2GB, which was fine for the compact cameras of the time. SDHC was developed to provide higher capacity (up to 32GB) as well as faster data transfer: up to 25MB/second on the High-Speed bus, and up to 312MB/second on the UHS-III bus. The SDXC standard was developed to provide higher capacity, with potential to store up to 2TB (terabytes) of data. Recent SDHC III cards share the SDXC III maximum data speed of 624 MB/second. The SDUC (Ultra Capacity) format followed quickly with a maximum capacity of 128TB. Key features of a current SDXC memory card. Announced on 27 June 2018, the new SD Express protocol combines the legacy SD (UHS-I) interface with PCIe and NVMe interfaces to provide transfer rates of up to 985MB/second. 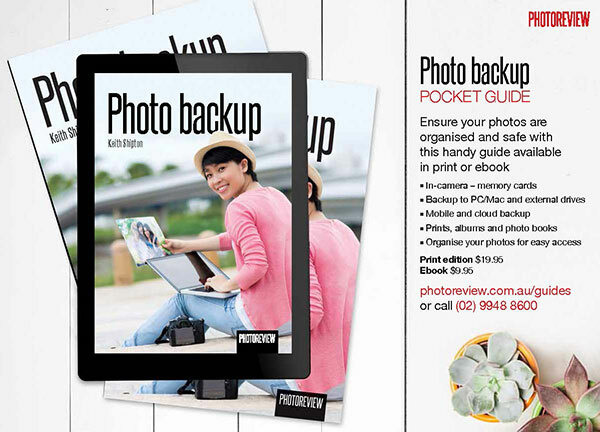 It can be implemented on SDHC, SDXC or SDUC memory cards. It uses the same pins and connectors as SD UHS-II but does not support UHS-II interface, featuring a new PCIe and NVMe interface. However, the first row of interface pins is backwards compatible with the SD UHS-I interface used in billions of existing SD host devices. Compact Flash (CF) cards have been the standard for most DSLR systems since the specification was formalised in 1994 by SanDisk. The flash memory chips used for data storage are installed in a standardised enclosure, which comes in two thicknesses: Type I cards are 3.3mm thick, while Type II cards are 5mm thick. Most modern cards are Type 1. Like SD cards, CF cards are speed rated, but the ratings are based on the audio CD standard of 150 kilobytes/second. A card with a 266x rating will be able to read and write data at 150 x 266 kb/second, or 39.9MB/second. Card speed is also determined by the camera’s memory controller, which in some cameras can’t handle the fastest cards. CF cards are also limited by their Parallel ATA systems, which have a maximum transfer rate of 167 MB/second, which is roughly half the speed of the fastest SD cards. CompactFlash and CFast cards have similar (though not compatible) form factors but different internal structures that enables CFast cards to support much faster data transfer speeds. In 2008, the Compact Flash Association recognised the potential ceiling of the Compact Flash card and developed the CFast infrastructure as a result. It uses a Serial ATA bus that increased read/write speed potential to 600MB/second with the most recent CFast 2.0 standard. Cameras offering CFast support include the Canon EOS-1DX Mark II and most of Canon’s Cinema EOS models as well as the Blackmagic URSA Mini. 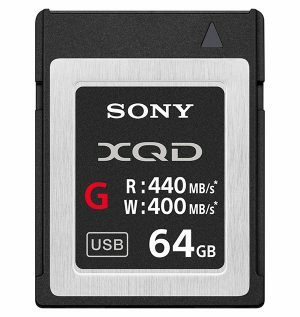 The XQD format was first announced in November 2010 by SanDisk, Sony and Nikon and was immediately picked up by the Compact Flash Association for development. The first cards were Sony-branded and went on sale in January 2012. The second generation cards pushed speeds to 1GB/second but they are not currently available. XQD cards support very fast data transfer speeds while maintaining a form factor that is only slightly larger than an SD card. Sony uses XQD cards in its broadcast camcorders, although only as secondary media. Nikon supports XQD cards in its D4, D5, D850 and D500 cameras. On 7 September 2016, the CFA announced the successor of XQD, CF Express. This new standard uses the same form-factor and interface but uses the NVMe protocol for higher speeds, lower latencies and lower power consumption. CF Express cards support transfer speeds of up to a theoretical maximum of 2GB/second. They are backward compatible with the XQD system, which suggests they will replace XQD in the future. Both CFast and XQD have been slow in adoption, with only high-end cameras using them. However, demand for higher transfer speeds and greater capacities should see this situation change. Sony still clings to the Memory Stick format it launched as the first-ever camera memory card back in 1998. However, today the format remains in a small-form-factor version, dubbed Memory Stick Duo or Memory Stick PRO Duo, which can be used in SD card slots. The fastest cards have a maximum transfer speed of 50 MB/second and a maximum capacity of 32GB. Other card formats that have been superseded include SmartMedia, MMC and xD Picture Card. All were replaced by cards that were faster and offered higher storage capacities. Card speed ratings are a source of on-going confusion because there’s no universally-agreed standard for measuring and quantifying data transfer speeds. 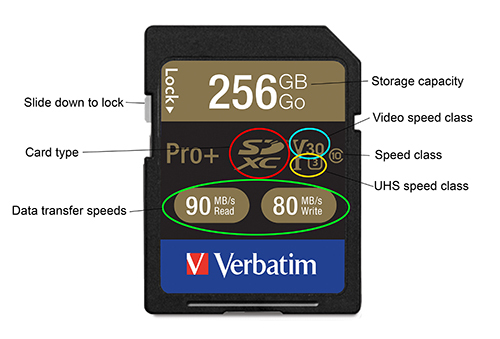 Some manufacturers rate their cards in megabytes/second (MB/s), while others divide their cards into a series of Speed Class levels with arbitrary symbols and numbers that can be difficult to compare with other speed ratings. SD cards were originally rated by Speed Class and that system persists today, also covering microSD cards. Each class can be indicated by one of three logos: a C with a number in the middle of it, a U with a number in the middle of it, or a stylised V with a number beside it. Compact Flash card speeds can also be confusing, with brands like SanDisk printing the maximum transfer speed in MB/sec on their labels while others use an ‘x’ number. 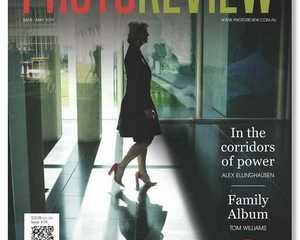 The ‘x’ number is based on the read speed of audio CDs, which is 150 KB/second. You can estimate the read/write speed by multiplying that number by 0.15. UDMA 7 – 167 MB/second. Some CF cards will also carry a figure showing the minimum sustained write speed. This is important for anyone who shoots video since sudden drops in writing speed can cause dropped frames. The minimum speeds for shooting video depend on the video format, with Full HD (1080p) movies requiring at least 8MB/second (Class 10 or 10MB/second is recommended by most camera manufacturers). 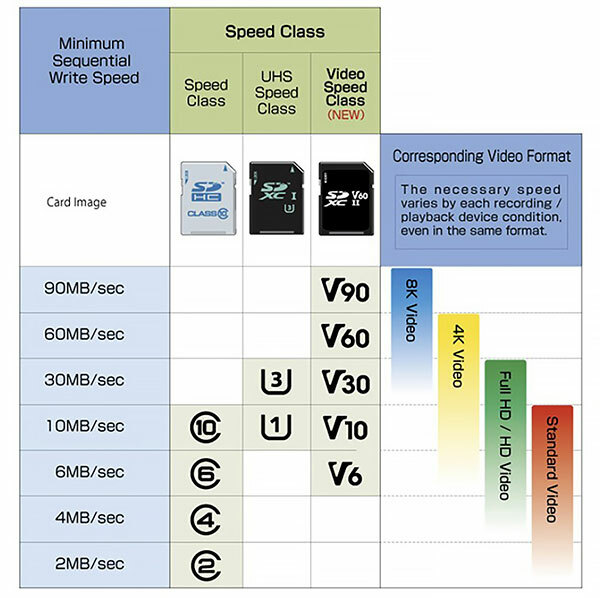 A minimum write speed of 30MB/second (UHS Speed Class 3) is required for recording 4K and high-bitrate video clips.